Most dog lovers want to spend every moment they can with their beloved pooch. This is why a number of them have also begun letting their dogs join in on their favorite hobby. Some of them have also taken their dogs on faraway holidays. If you want to do something different from the usual game of fetch or walk in the dog park, here are 15 awesome activities you can do with your dog. If you’re asked what sport or activity you think physically capable dogs do, mushing may be the first thing that comes to mind. Despite this sport being more closely associated with the winter time as well as with colder climates, there are places that offer this experience year-round. This means that if you choose this activity for yourself and your dog, you can still stay fit even when the warmer weather comes around. Mushing is not only a sport, but it is also a viable mode of transportation. In fact, earlier variations of mushing date back to as far as 2000 BC. The practice of having dogs pull sleds with loads on them originated in Siberia as well as in parts of North America. Over time, this more practical application of mushing gave way to the races we see today – the most well-known of these races being the Iditarod and the Yukon Quest. If your dog does not yet have enough strength for the heavier loads involved in mushing, then you both may want to give carting a try. Unlike in mushing, the loads used in carting events are significantly lighter. This makes them much easier to pull. Once your dog grows in size and gains more strength, then, by all means, you can try out mushing again. However, this event is perfect for younger dogs, especially those that belong to smaller breeds. Some dog owners enjoy this activity for the sheer pleasure of being with likeminded people. For others, this serves as an opportunity to prove who has the fastest, and therefore the superior pup. If you do get into this sport, it would be good to know that some dog training facilities actually offer classes that teach dogs how to be better at carting. Similar to mushing and carting is bikejoring, which is often referred to as the urban equivalent of mushing. Instead of riding a sled, your dog has to help pull your bike as you ride along straight roads and tight corners. You could also use a scooter if you don’t have a bike on hand. Even better if you have hills to go upon. This activity is perfect for groups, as you can organize races if you have enough space to do so. It is important that you first train your dogs in a more open area. Trained dogs are much calmer, especially in less familiar situations. If your dogs are well-trained, they are less likely to panic in stressful situations. This also means that they are less likely to run off in different directions when startled. Before you go out bikejoring however, you should make sure that you have the proper equipment. Like any sport, this one has risks involved so it would be best to wear safety equipment such as a helmet as well as kneepads and elbow pads. You should not go bikejoring on a busy street. Regular ropes and leashes just won’t do in bikejoring also. Special equipment can be bought in some pet shops as well as in stores that specialize in the sport. Skijoring is another variation of bikejoring. Here, instead of having the dogs pull your bike along, they will have to pull you along while wearing some cross-country skis. You can try this out during the colder seasons, when there may be too much snow on the ground to safely hop on your bike. Another interesting activity you could do with your dog is performing agility courses. The aim of this sport is to complete a set course in the fastest time possible. The difference between first place and second place could be less than a second, which makes this dog sport one of the most exciting. Who knows? Your little pooch might get good enough to join, or maybe even win, an agility course competition one day. Not only does doing an agility course challenge your dog’s physical capabilities, but it also helps stimulate them mentally. Contrary to what others may think, you don’t need to spend a lot of money on professionally-made obstacles to make a decent agility course. You can setup your own with recycled materials as well as a bit of time and patience. For example, you can make a balance board out of an old coffee table. You could even make slalom posts out of pieces of PVC pipe or from old ski poles you don’t use anymore. If agility or obstacle courses aren’t your dog’s thing, then maybe they’ll enjoy participating in field trials. Also known as hunting trials, this activity has different variations for different dog breeds. More specifically, there are events designed for retrievers, pointing dogs, and hunting dogs. A retriever field trial, for example, requires your dog to retrieve a particular object over a considerably long distance. You could even think of this as a more advanced version of fetch. This event is judged based on different factors such as how your dog marks a fall as well as their memory, style, courage, and attention to detail. In some events, judges will also examine your dog based on their learned abilities such as their responsiveness to the directions you give as well as their steadiness in delivering a bird. Pointing dog trials are judged on different criteria including, but not limited to how willing they are to begin the hunt, their ability to find the game, and their style and courage during the event. In some events, the trainers will be on horseback, while in others they will be required to travel on foot. Hunting dog trials work in basically the same way. However, judges in these events may also give extra credit to a dog who hunts game cleanly. If you’re involved in charity work and other forms of outreach, then you may also enjoy having your dog tag along for these activities. Your dogs can help out in one of two ways: animal-assisted activities (AAA) or, for some of the more experience pups, animal-assisted therapy (AAT). Animal-assisted activities are usually done in nursing and retirement homes. The dogs involved here don’t necessarily have a rehabilitative purpose, nor are they needed to help meet a patient’s goals. They are there, however, to encourage socialization and to improve the overall mood of the place. The animals and the trainers involved in this activity need not be certified by any officiating body. On the other hand, animal-assisted therapy is more goal-oriented than AAA. Another difference between AAT and AAA is that the animals and trainers involved in the former require certification. This is because they will be directly involved in some form of medical care. Luckily, there are many bodies which provide this type of certification. Animals certified for AAT can be used to help those with mental health concerns. They can also help distract those who suffer from chronic pain. 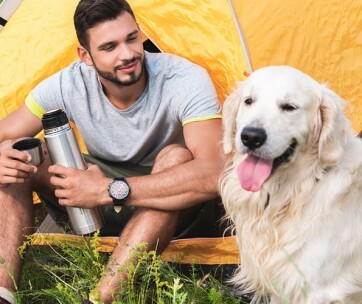 Enjoying the great outdoors can only get better when you do it with your pet. If you’re planning to have an adventure with your dog, you must first make sure that they are physically prepared for the trip. If they appear tired and sluggish most of the time, then it may not be a good idea to bring your dog with you at the soonest. They may need some time to build up the endurance they need so they may complete the trip. You can help your dog build up the necessary strength by doing some of the other activities mentioned on this list. 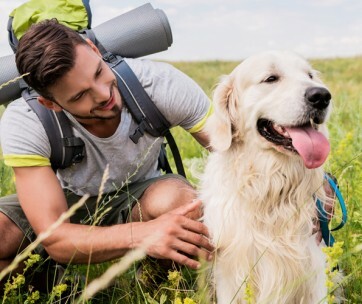 Once you have determined that your dog is ready to go hiking with you, the next logical step would be to look for a dog-friendly spot to go to. You can do so through scouring various websites on the Internet or by posting about it on forum message boards and social media platforms. Once you’ve found a suitable spot, you should go and learn the proper etiquette for it. There may be subtle differences from place to place, but for the most part, this would involve things like cleaning up after your dog and not letting them dig too much. 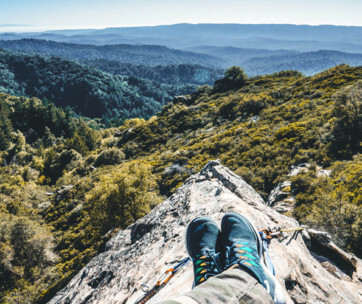 It would also be wise to take note of the common dangers that could affect both dogs and their owners when they go on hiking or backpacking trips together. If you’re letting your pet carry things with them, then you should also learn how to properly pack them to ensure that your dog is comfortable and safe throughout the trip. You could also pick up or make your own pair of dog booties to maximize their comfort as well as to prevent slipping and tripping. 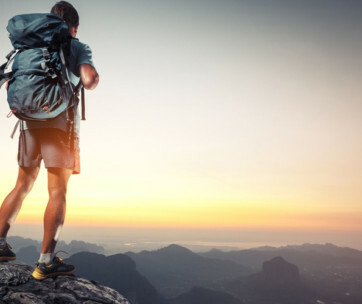 Having this in mind, pack your backpacking backpack, put on your hiking shoes and hit the road. Sometimes, the simplest things are the ones that work the best. Taking your dog to the park is something you can do at least once a week. Places like this allow dogs to roam free and interact with one another. If your dog is a social butterfly, then this one should be a no-brainer. Dog parks also give owners and trainers an opportunity to kick back and relax, even if just for a little bit, while their dogs keep each other busy. A large population of dog owners chooses to bring their pets to these parks for safety and convenience purposes. In terms of safety, the perimeter of most dog parks is secured via a fence. This means that dogs would have an extremely difficult time trying to get away even if they give it their best shot. Some parks even have separate sections based on the size of the dogs. There is also signage posted around most dog parks that indicate the basic etiquette both the dogs and owners have to show while they are in the vicinity. Another classic in the dog lovers’ community, Frisbee is a sport that most dogs can’t seem to get enough of. In fact, dogs that regularly play Frisbee are lovingly called “disc dogs.” Before anything else, though, you should consult with your veterinarian regarding whether your dog can participate in this activity. Some dogs with conditions such as hip dysplasia could see their aches getting worse with all the jumping and running involved in this highly active sport. Once you get the green light, there is an endless amount of fun to be had. It may take some time to teach, but once your dog gets the hang of it, they’ll be excited every time you bring out their disc. Begin by using a soft Frisbee. Roll this in front of your dog or throw it gently at around their height. Once it has landed, encourage them to bring it back to you. After just a couple of tries, you will notice that your dog is able to catch discs that are thrown higher and a lot farther than before. Going out for a run with your dog is not something only the physically fit can enjoy. No matter what your pace is, you can always enjoy burning a couple of calories together with your beloved pet. But of course, with any activity you plan to do with your dog, some precautions should be taken. If you can, wait a full year before bringing your dogs out on regular runs. This is because it takes that much time for a younger dogs’ skeletal system to fully develop. 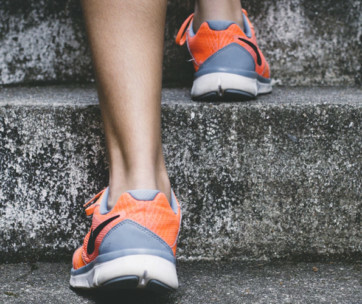 If not enough time has passed, then you can take them on shorter, warmup runs in the meantime to help develop their endurance. Making running with your dog a routine is also advisable. If you do so, you will see that they will already start getting riled up as soon as you pick up your running shoes. They will look forward to putting on their harness and their leash. By the time you step out of the front door, they will already be raring to pick up the pace. However, before getting your run started to make sure that the route is paw-friendly. It will also be better if you can make your dog wear shoes or a pair of booties. Protecting your pet’s feet is important especially on warmer days when surfaces such as concrete can be extremely hot. Speaking of temperatures, you should also make sure that your dog is just as prepared as you to run during the colder seasons as well as in the summertime. If your dog enjoys the water more than trails or the mountains, then maybe you should both try kayaking. This sport provides a great workout for you and your pet. You will get to strengthen your core and arms, while your dog gets to go out on a swim. Most dogs will enjoy going out in the open waters and kayaking, as long as they know how to remain calm in situations like that. Start by getting familiar with the kayak. This applies for both you and your pup. You should learn the basic motions needed to propel, stop, and turn the kayak. If possible, you should also learn how to turn the kayak back over if it happens to flip. Meanwhile, your dog should be given time to sit on the kayak while it’s still on the dock. This gives the animal time to adjust to its new surroundings. It also helps you determine whether a one-man kayak or a tandem one is better for your purposes. Don’t forget to bring a personal floatation device for your dog, even if it has already learned how to swim. Bringing a friend to help out while in the water won’t hurt either. Start out in calmer waters until you and your pooch get the hang of things. Once you both get comfortable, you can begin branching out to previously uncharted waters. If it’s your dog’s special day, then a party may be in order. Invite some of his or her close friends over and have an amazing time! You could prepare games that both the dogs and the owners can enjoy. You could even prepare food that caters to the taste of both. Just remember that dogs have some strict dietary rules you have to follow. Do this to make sure that everyone enjoys themselves safely. A birthday is not the only reason to set up a party for dogs though. Maybe you’d want to organize a get-together for a dog that just finished obedience school or another form of training. You could also plan a party for special holidays such as National Dog Day, which is held every August 26. 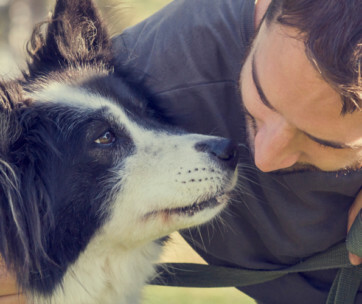 Doing these activities with your dog can help form a stronger bond between the two of you. You can choose to do some physical activities if your dog is of a high-energy breed. On the other hand, you can do some less-demanding activities if your pet needs some rest and relaxation. No matter which one you pick from the list, you will be guaranteed to enjoy.